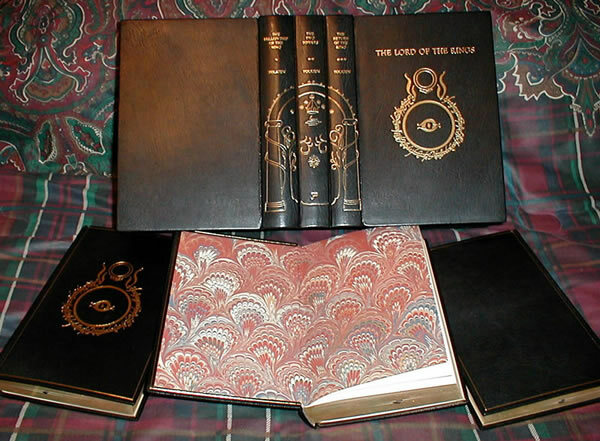 1st UK Lotr's 1st imp, Tipped in Tolkien Signature, Gates of Moria rebound black leather full clamshell case - SOLD George Allen & Unwin, 1954/54/55 1st UK Edition The Lord of the Rings. George Allen & Unwin, 1954/54/55 1st UK Edition The Lord of the Rings. The Fellowship of the Ring is a 1st impression published in July of 1954, featuring a tipped in signature by J.R.R. Tolkien. The signature is mounted and hinged on vellum, lightly tipped in front of the title page. The Return of the King is a 1st impression dated 1955, 1st State (as per Hammond and Anderson) with signature mark '4' and the infamous slipped type. All original maps are present and in Near Fine condition. 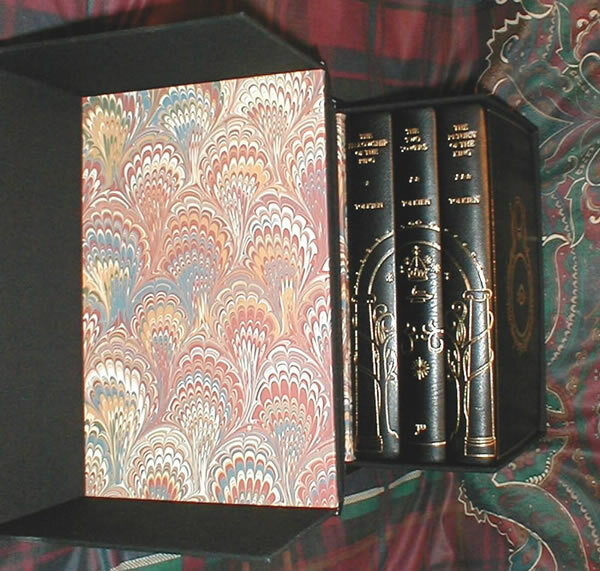 An extraordinary set of first editions of this classic of fantasy literature. 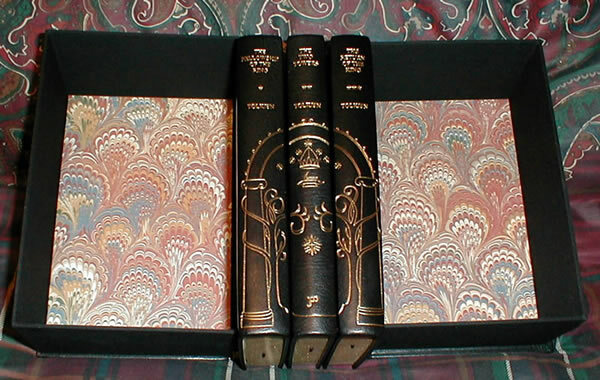 The set is fully rebound in Black Morocco Leather, all edges trimmed and gilded, with the original cloth spines bound in the rear. 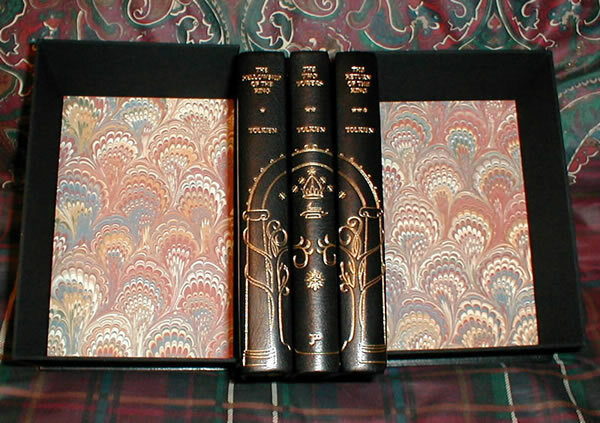 Features the Gilt stamped design of Tolkiens original line drawing "The Gates of Moria", split between the spines of the three volumes. 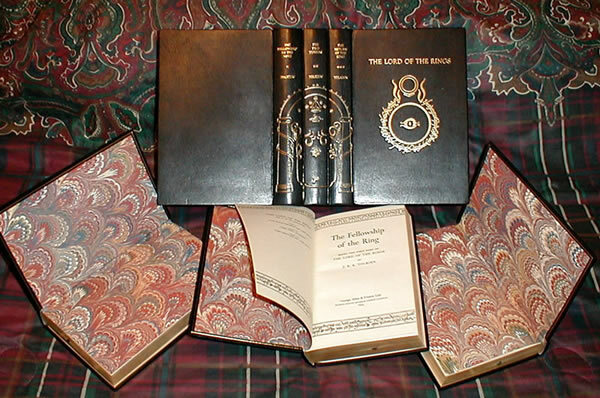 The set features the "Ring and Eye" from the original UK dustjackets, gilt stamped to the front boards as well as the case. Single gilt rule at edge of the boards, both interior and exterior. These are a beautiful design, executed by one of America's premier binders. All are very clean and bright, without any foxing, and with no writing, or previous owners names. Beautiful looking set, with a classic design.